As defect concerns have evolved, so have the inspection tools available for process monitoring. For a long time, semiconductor defect inspection focused on particles, and particle defects remain an important cause of yield loss. But as devices have become more complex, additional kinds of defects have drawn the attention of process engineers. Bridging, pattern collapse, and other resist defects have become particularly important in the sub-100 nm era. The introduction of CMP brought abrasive slurries, scratching, and dishing defects. As defect concerns have evolved, so have the inspection tools available for process monitoring. Beyond particle scanners, we now have electron microscopes for CD inspection, broadband imaging for scratch and void detection. Still, all these tools use some form of imaging to identify physical defects in the structure of the device. They cannot capture another, increasingly important, class of defects: those that affect the chemical structure of the surface. Such non-visual defects (NVDs), as they are called, can have as many root causes as physical defects. Metallic contaminants in a cleaning bath can coat a wafer with ions. A few monolayers of residue might be left behind by the post-etch clean. Any wet chemistry step might leave drying spots. Any of these defects can have a profound impact on device behavior. Since optical inspection methods are ineffective for these defects, new inspection technologies must fill the gap. For example, the ChemetriQ technology from Qcept uses a scanning probe to measure changes in the work function of the wafer surface. As Robert Newcomb, Qcept’s Executive VP of operations explained, metallic contaminants generally increase the work function, while non-metallic materials usually decrease it. Although the system does not directly identify defect types, it can help process engineers decide where to look for problems. Furthermore, by inserting an inspection point after a short process loop, the system can identify defects that might otherwise go undetected until final electrical test. In one case, Newcomb explained, an SRAM process produced chips with an unacceptable degree of speed variation, causing the end customer to reject the devices. These variations matched work function variations seen after the spacer etch and ash steps: when those processes were modified, the tighter speed distribution resulted in a 20% increase in salable die per wafer. Equally important, even before the problem was solved, being able to correlate observed NVDs with device performance helped the fab present a credible action plan to their customer. While discussions of inspection technologies often focus on leading edge processes, each device category faces its own yield challenges. For example, rapid growth in wireless connectivity is creating new markets for analog devices. Particle specifications for these devices are somewhat relaxed due to their large size. Residues, on the other hand, can easily cover large areas, wiping out a substantial fraction of the wafer. One analog fab reported poor yield after lithography rework. 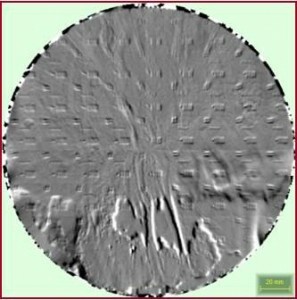 While they suspected BARC residues might be responsible, optical and SEM defect data didn’t match the areas of poor yield. The ChemetriQ tool, on the other hand, found dramatic evidence of residue in the suspect area. Sometimes, knowing that residues aren’t present can be as valuable as knowing when they are. The profitability of a fab, especially one using mainstream processes, depends on costs as well as yield. One such fab used NVD inspection to show that they could extend the life of an IPA cleaning bath without increasing defects. As a result, the fab saved $70,000 in chemical costs per month, while cutting IPA effluent in half. In the semiconductor industry, it’s understood that each technology generation brings new processes and new materials. What’s less obvious is that each generation brings new defect mechanisms as well. Process engineers have a constant need to upgrade the “eyes” they use to watch over their processes.